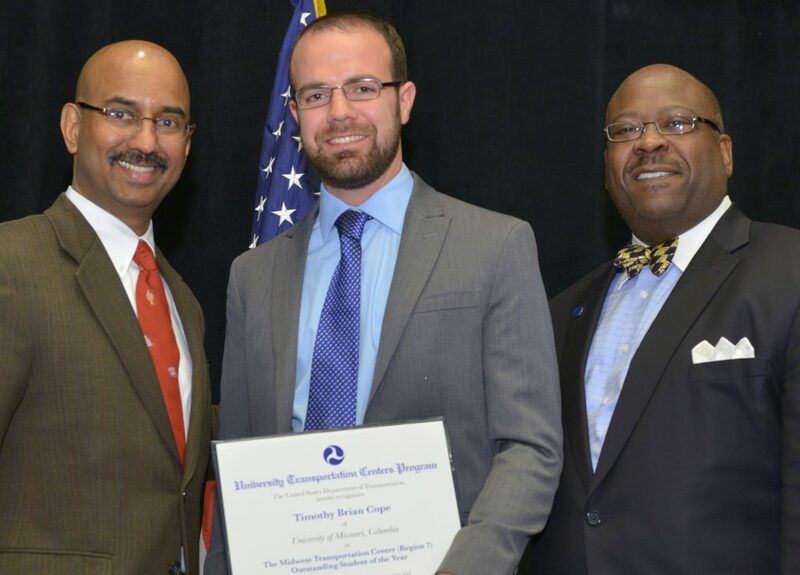 Timothy Cope (center) at the 2015 TRB awards ceremony for the U.S. DOT’s UTC Program. With him are (left) Shashi Nambisan, president of CUTC, and Gregory Winfree, director, Office of the Assistant Secretary for Research and Technology (OST-R), U.S. DOT. The MTC at Iowa State University’s Institute for Transportation is pleased to announce that Timothy Cope, graduate student in civil engineering-transportation, has been named the MTC’s 2014 Outstanding Student of the Year. Tim is a superior example of the “next generation of leaders in transportation” being supported and mentored through MTC’s education enhancement programs. Tim is a high achiever in both the classroom and laboratory, a professional on project teams, and an effective supervisor of undergraduate research assistants. He also possesses excellent communication skills and is a successful instructor, receiving high scores on teaching evaluations for his conduct of laboratories for the fundamentals of transportation engineering class. For two semesters, Tim has also helped with the technical aspects of the weekly Tom Maze Transportation Seminar, in which students and professors from multiple universities meet via distance technologies to discuss current transportation issues. Tim is involved with several research projects. For example, he assisted with the data collection and analysis of the first known deployment of an audible mobile work zone alert system in the United States. This is an especially timely project due to the proliferation of portable devices (e.g., smart phones). Tim presented this research at the 2015 Transportation Research Board conference in Washington D.C. He is also working on the analysis of work zones for roadway designs such as the diverging diamond interchange and the restricted crossing u-turn intersection. Tim will receive his M.S. from the University of Missouri in May 2015.